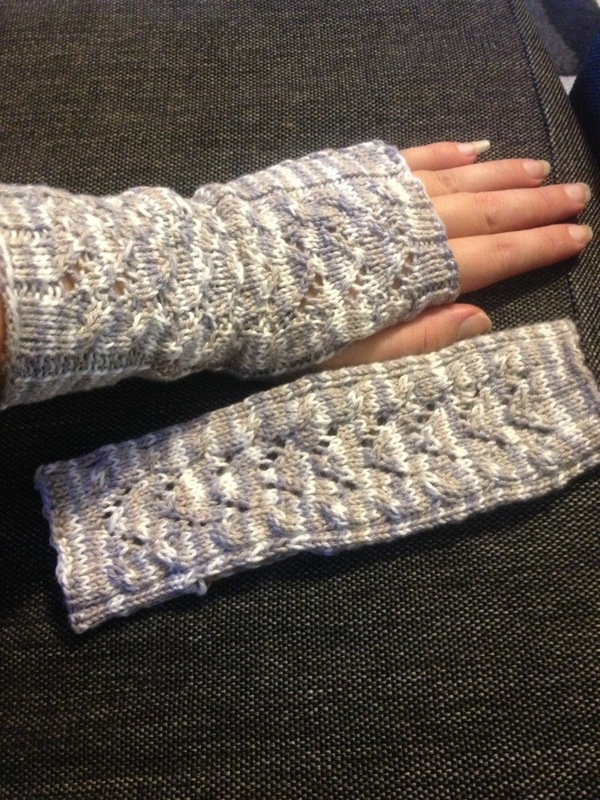 I finished off the mitts for my grandma in law. And I’m pleased with the way the turned out. I’m always a little nervous adapting a sock pattern to mittens, but it worked. After some trial and error the magic number to cast on was 50. The summer sky pattern is over 21 stitches so I added a border of 4 knit stitches. 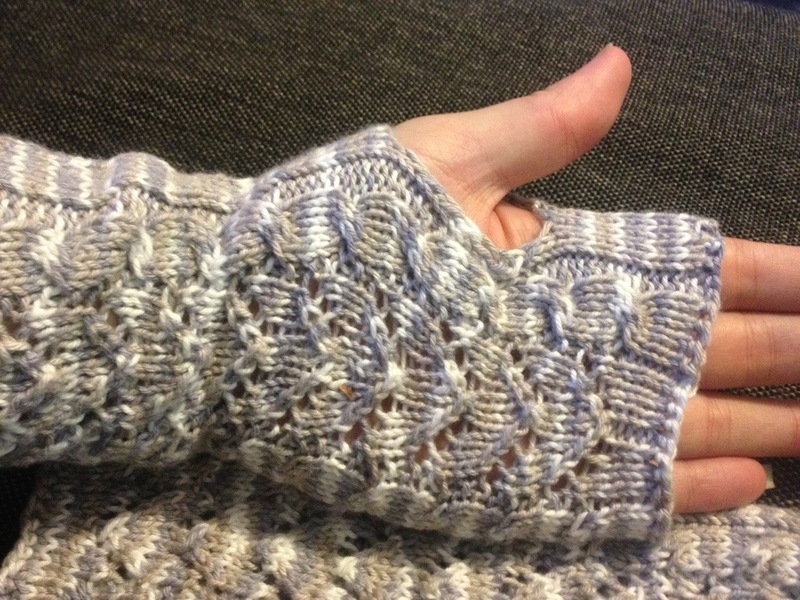 I kept trying them on, and when they were about ready for the thumb hole I worked back and forth slipping the first stitch. Then when I could close them up around my thumb I starting working in the round again. Two at a time, magic loop makes sure the they’re exactly the same. One of the reasons I use it for almost everything that comes in pairs. I almost wish they weren’t a gift. I recommend the pattern! I’m thinking about making a pair of yoga socks from it as well. Thanks!! I have never made socks. It would be a first. I’m a sock addict. Which is odd as I don’t wear socks a lot. I find them almost second nature now, but it took me a bit to figure them out. 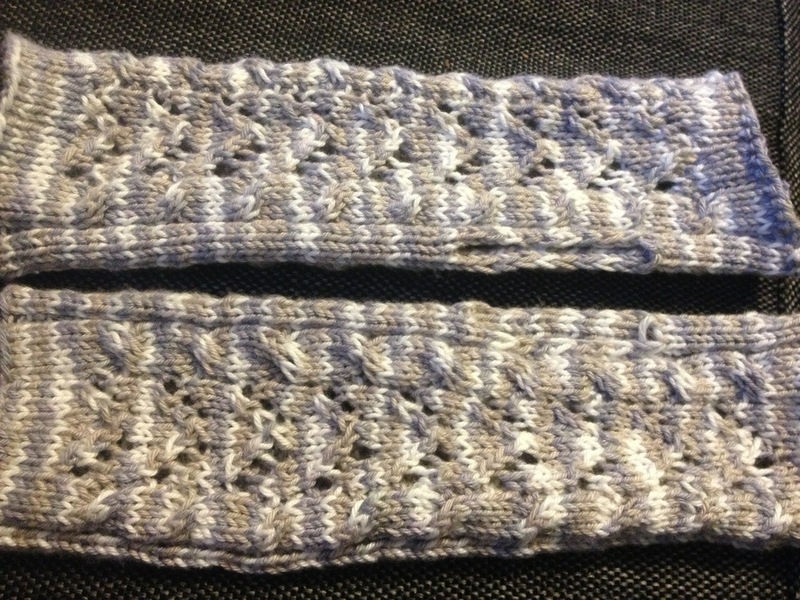 Though saying that I’ve never knit a sock on dpns – magic loop fan. What’s your favourite thing to knit??? I will have to check out that magic loop as I don’t know what that is. Right now my favorite thing to knit is shawls, but it changes. I used to always do children’s sweaters with an intarsia border, then afghans, then shawls, and now I am into designing some critters. Oh, lol, I was on a poncho craze for awhile, too. I sort of do so many I get a bit burned out on it and then do something different for awhile. Intarsia seems really daunting to me. I’m still getting the hang of two colour scarves. They sound fun. All things I haven’t really tried before. I have knit one shawl, but it’s really small and I don’t know how to wear it or how to edit it so I would wear it. I have given all the shawls as gifts as I would only know how to wear one to cover up over my shoulders in the house to keep warm and read a good book. My grand daughters used to love the “Little House on the Prairie” books so I thought it a cute idea to make prairie shawls like the girls would have worn in that time period, then it grew to a shawl for every female in the family and I had A LOT of yarn stash to use up, so just did the easy garter stitch with a border increasing 1 stitch at the beginning of each row from the point. Didn’t take a lot of thought or skill. Intarsia isn’t that difficult if one only uses a couple of colors which I do. In the round on circular needles one can do an easy design that carries the yarn with the knitting. I do simple patterns like hearts or sail boats so I only have to carry 1 color every 2 or 3 stitches round the bottom and the yoke on each row, no seams.. I was doing them to sell at craft shows and it set them apart from just a plain sweater, but had to be simple to mass produce them a bit.